Separate bank accounts are a must when running your own business. Keeping personal and business finances separate will help to ensure there is no messy mix-ups. Nothing goes to waste. Ensure your staff keep receipts or invoices for expenditure and attach them to expenses claims. You then to keep all records for at least six years, just to be safe. Filing paperwork should be simple. Sales invoices should be raised and filed in order, whilst purchases should just follow a system that is logical to you. Working to a routine, a plan, a schedule can help you to stay on top of your finances. Diarising time to update records or reconcile your bank account will mean you stick to it and it doesn’t become a forgotten chore. Raise sales invoices quickly and file paperwork on time, you’ll be able to remember what happened last week but not last month or the month before. Reduce the risk of theft or missing cash with a keen eye on petty cash. Keep receipts and reconcile the account regularly to stay on top of things. Cash and cheque payments might be old school but it’s important you stay on top of things and get them banked fast. You’ll reduce the chances of losing them, spending them and the quicker it’s in the bank, the better for your cash flow. Set a policy for chasing debtors, as slow payers can cause real harm to your business and cash flow. You aren’t loaning money so your clients need to pay. Putting money aside, perhaps in another account will mean there are funds available should HMRC come knocking. There will always be future expenditure such as VAT so plan ahead. You should always have a professional handle your finances for you but knowing the basics can help you day-to-day. To stay compliant and out of trouble, you should always look to hire a professional. Work with a local bookkeeper or speak to your accountant for support. You are good at what you do so leave the finances to those that are good at what they do. There is no excuse for missing your self assessment tax deadlines and unfortunately HMRC do not accept excuses! 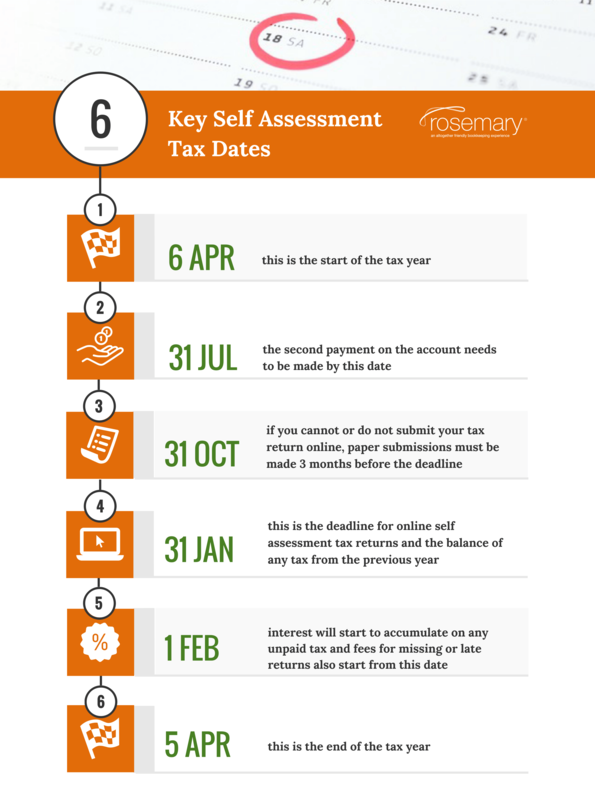 Therefore we’ve produced a quick guide to the six most important self assessment tax dates…. download our guide and save it for future reference or you can always call our local teams for more help! This is the deadline for additional payments if you make advanced payments on your account (known as ‘payments on account’) but you don’t want to miss this one – there are penalties if you do! This is the deadline for filing a paper tax return, whether you choose to work out how much tax your owe yourself or want HMRC to do it. However, if you receive notice that you must file a tax return after 31 July 2017, you’ll need to send back the completed form within three months of the notice’s date of issue. This is the final deadline for online tax returns, unless the notice to make an online tax return is issued by HMRC after 31 October 2017, in which case you have three months from the date of issue. This is also the deadline to pay any tax due for paper and online filers. It’s important to be aware that filing your tax return late, or failing to pay the tax you owe on time, will probably mean you face extra penalty fees and interest charges, starting from the very next day! This is the end of the tax year and shortly after this date anyone who is required to file a tax return will receive a notice advising that you must file a tax return for the tax year just ended. For further help with these self assessment tax dates or bookkeeping advice, why not contact your local Rosemary Bookkeeper! A recent report for the business innovation charity Nesta suggests that Small businesses’ growth could be stifled because of the burden of financial administration and also warns that a lack of transparency in the market for financial products can hamper small firms. It found that 42% of entrepreneurs say dealing with finances is the most stressful aspect of running a company, while 17% add that the stress has made them unwell. The vast majority of small business owners handle their banking and finance without professional help. One in five spend more than eight hours a week managing their banking. 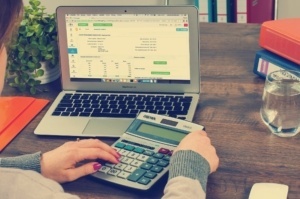 If you can identify with these findings then outsourcing your bookkeeping is an easy way to ensure that a professional is dealing with your business finances giving you more time to spend developing your business and looking after your health! If you would like further information please get in contact with us 0345 862 0072 info@rosemarybooks.co.uk. https://www.rosemarybooks.co.uk/wp-content/uploads/2017/09/red_binder_on_orange.jpg 800 1600 Jeff Perrin https://www.rosemarybooks.co.uk/wp-content/uploads/2017/08/rosemary_logo_with_strap.jpg Jeff Perrin2017-05-25 16:48:482017-09-19 14:56:08Is the stress of financial paperwork making you ill?